Every one is talking about the recent news conference where President Bush's foreign policy was finally explained to him in a manner that was befitting of his own actions. On the other hand, I don't see what the big deal is - it's not like the scenery has really changed. Bush has had his foot in his mouth for ages. Talabani looks like he totally saw it coming. The Bush administration was right--the media hates them. I loved this video and the way they kept showing the throw over and over and over ... great! Oh, and thanks for the link below! 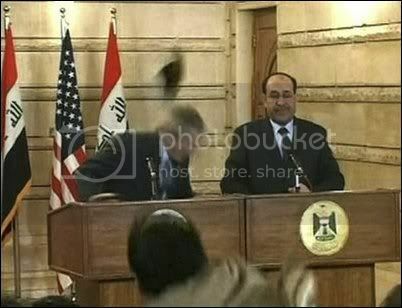 Iraqi reporter probably throws "horse shoes" better, he just was not thinking! Drat. I love the riff on Magritte. I recently explained the entire dadaist movement to a lovely young lady at work. It was occasioned by the removal of the urinal from the men's room Apparently, we lost our privileges when we complained about the urinal's leak. The absurdity of a urinal taking a leak was lost on all but me. 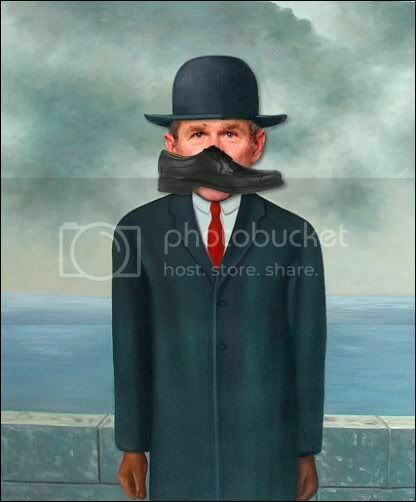 You have to admit, Bush ducked the shoe pretty deftly. Perhaps after office, he could go work in a carny dunk tank. I imagine it would make a lot of cash. So he was a shoe in? I'm guessing shoe dodging is something he does every night that Laura doesn't stay at the Mayflower Hotel. CDP: Maybe he was in on the whole thing! Never trust a member of a puppet government, especially it it's a puppet government that you created! Distributorcap: Ha! Quadruple that amount! Pay him as much as we pay Blackwater! Bubs: yes, and was there ever any doubt? BAC: It was hilarious! I loved it! themom: That would have been nice. Drat! D. Debil: Ha! That's a great story. Jon the Intergalactic Gladiator: I agree! But then again, he has lots of practice at dodging the media and ducking responsibility. MWB: As Ed Sullivan would say, "it was a really big shoe!" Jess Wundrun: Yes! shoe dodging and ducking those frying pan swings. Batter up!